When we reached the gates of a building which I later realized was the historic Nana Wada, the man whom you see in the featured photo offered to give me a guided tour through it. I asked him whether I could try to take a look without his help. He smiled pityingly and held the door open for me to enter. This was a mistake, because the building now holds a municipal office which was about to be shut. I was escorted out by a genial pot-bellied policeman who could easily find a role in a Bollywood slapstick. The self-professed guide had disappeared. Opportunity knocks only once, as they say. 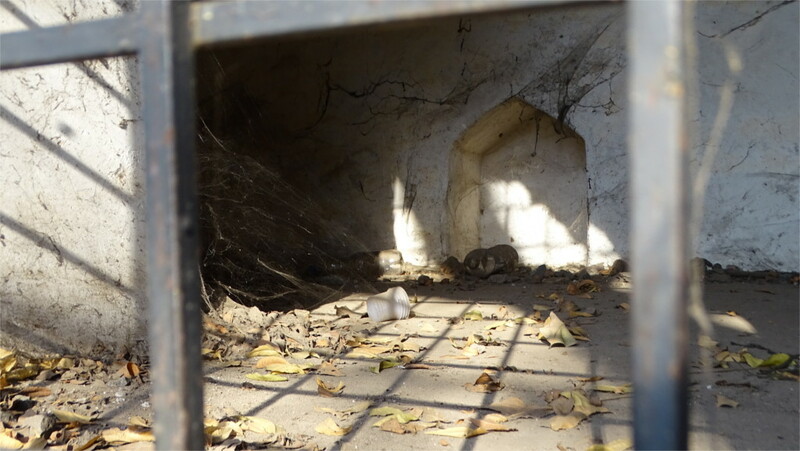 While walking around the high walls of Shaniwar Wada, I came to a little square called Jijamata Chowk and saw the unlikely structure which you can see in the photo above. 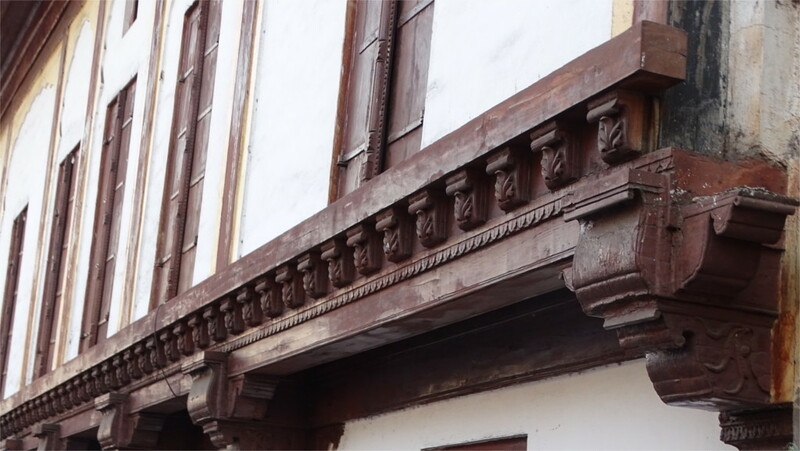 A colonial style facade was tacked on to a beautiful 17th century Maratha-style building. This is Nana Wada, the offices of the famous Nana Fadnavis, the minister who held the Maratha empire together in its last flowering. A decade after the death of Nana Fadnavis, the Maratha empire was defeated, and the British East India Company became the undisputed power in India. So this merger of styles is literally a shotgun wedding. I walked up to the colonial part first. 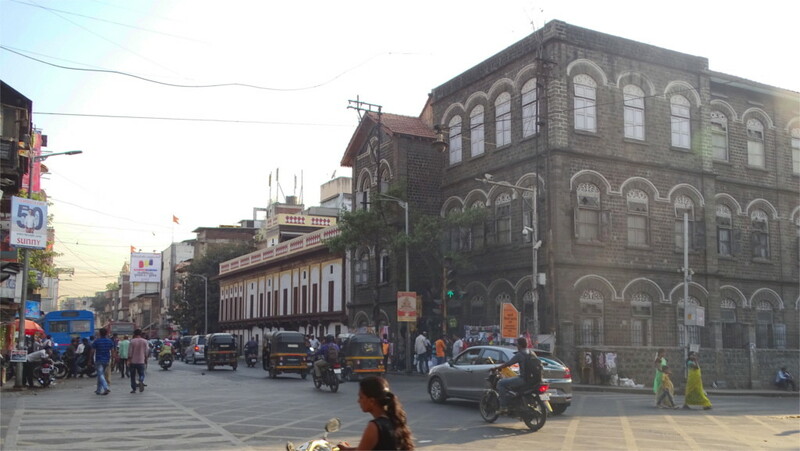 This style of building is common in Mumbai. 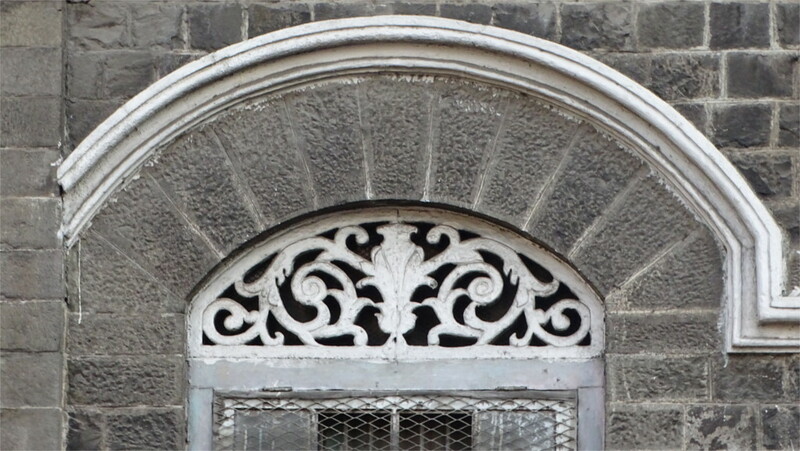 The grey stone with white borders, and white painted woodwork over doors and windows is typical of 19th century colonial architecture in this part of the country. My companion on this walk was from Kolkata, and he was enchanted by the colour of the stone. This stone is not often seen in other parts of India. I found later that this part was built to house a school by a charitable trust which operated out of Nana Wada in the late 19th and early 20th centuries. What is most remarkable about the structure is the rest of it. The part that we could see from the road is a two story structure, with unevenly spaced windows. The elaborate woodwork signified that the building housed someone important. The strong afternoon sun drew beautiful red colours out of the dark wood. When we ducked through the door, we saw that this was the outer part of a quadrangle. The inner buildings around the open garden were taller. The woodwork continued everywhere inside. The policeman who stopped us from going further was still proud enough of being associated with the history of this building that he let us admire the beautiful carvings overhead. I suppose I will go back to look at the interior more closely. Walking around Shaniwar Wada in Pune, I was impressed by this juicer. I’ve earlier seen this kind of a machine being used to extract juice from sugar cane. Here it has been put to use to extract juice from pineapples too. The man in the checked shirt got a large mug of pineapple juice. I guess a press of this kind can be used to extract juice from any hard fruit. I liked the sight of that charm hanging over the machine: the lime and chilis on a string. The shopkeeper also has made the effort to put a garland of flowers around the press. That’s nice. The bells tied around the big wheel make a nice jingling sound while the press is running. The area around Pune produces sugarcane as a primary crop. So I guess machines of this kind are fairly common. Then it stands to reason that the same machine will be put to other uses as well. Innovation! 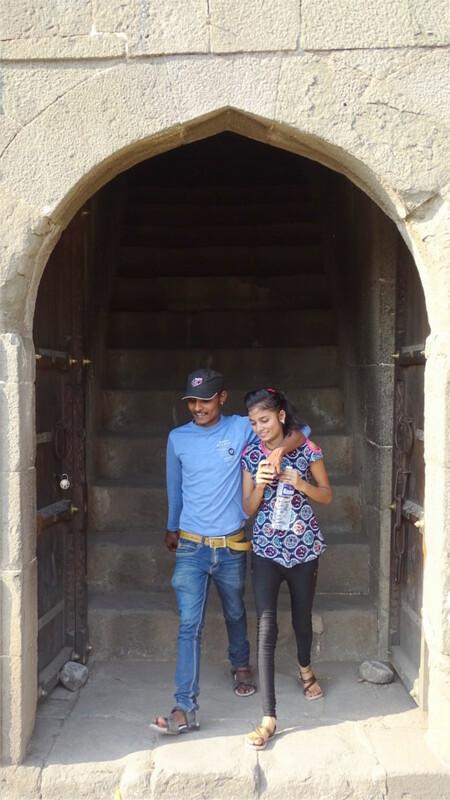 Shaniwar Wada in Pune was the seat of the Peshwas in the declining years of the Maratha empire. The palace complex was built in the first third of the 18th century CE, and burnt down in 1828. A Peshwa was originally the prime minister of the Maratha king, but during these years became effectively the head of the empire, and the position became hereditary. Although the empire was not as strong as it was in the beginning of the 18th century, a large part of India’s politics was transacted in this complex. This former place of power is now effectively a walled garden for Puneris. As we entered the main gate of the palace, I saw this middle aged man relaxing near the entrance. I wondered whether he was retired and found this a good place to get away from home and do some people watching, or whether he’d had a tiring day at work, and was just sitting here for a while before making his way home. It didn’t look like he was planning to stay here long. From the ramparts I looked down at the front apron. 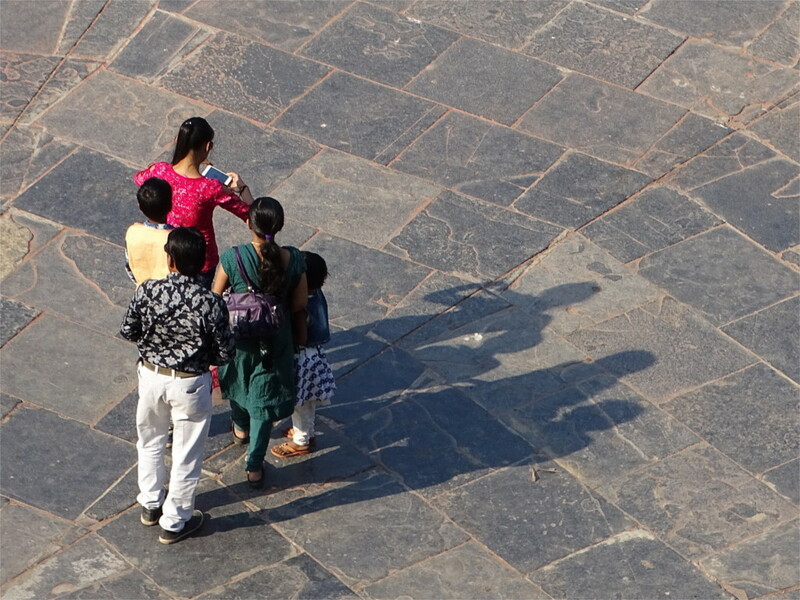 Families were milling about, each trying to take a photo against the walls of the palace. As I watched, this girl positioned her family behind her and took a selfie. It took a couple of tries, but the one she’s examining in the photo above seemed to satisfy them all. I positioned myself in front of this arch because the doorway and the stairs behind it made a nice picture. The photo would come to life when someone came down the stairs. I was lucky, the first people to descend were this young couple. I saw many couples like them in the complex. 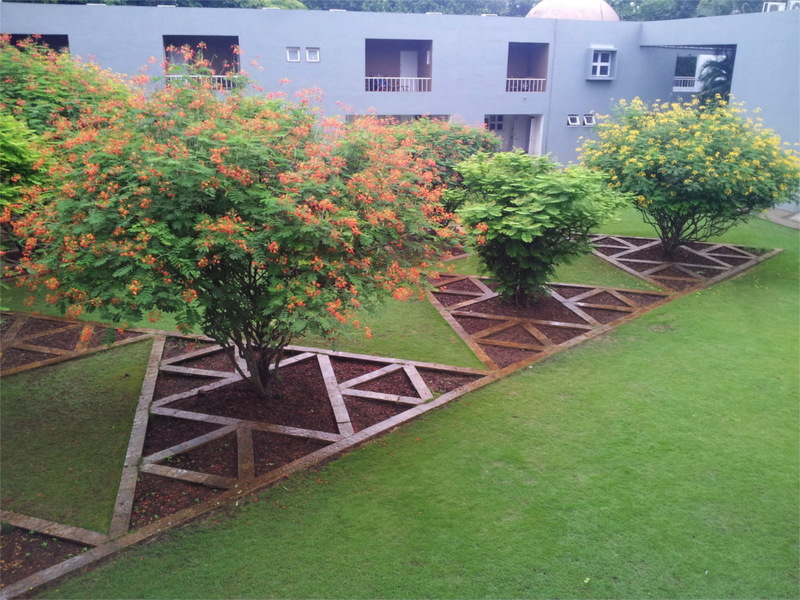 The seat of the Peshwas has now become a garden for couples to spend time in. This lady was clearly determined to have a little time by herself. 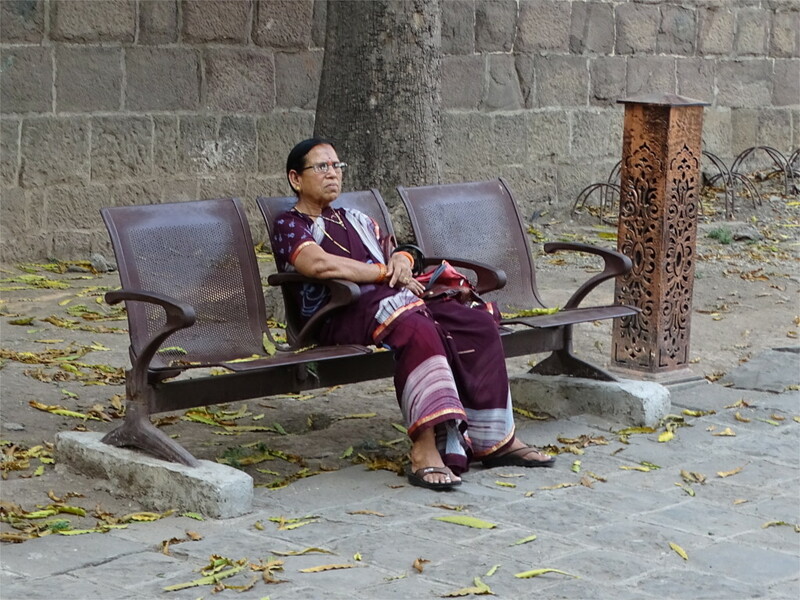 She was in a rather nice sari, sitting alone on the bench (it was very pleasant in the shade). She was quite relaxed while watching people around her. But she noticed me taking her photo and stiffened. In 1818 the Maratha empire lost their final battle against the British forces in Khadki and Koregaon, not far from this palace. Just a short hundred years later, three or four generations, almost in living memory, the court of the Peshwas has become the playing ground of commoners. What could happen in another hundred? 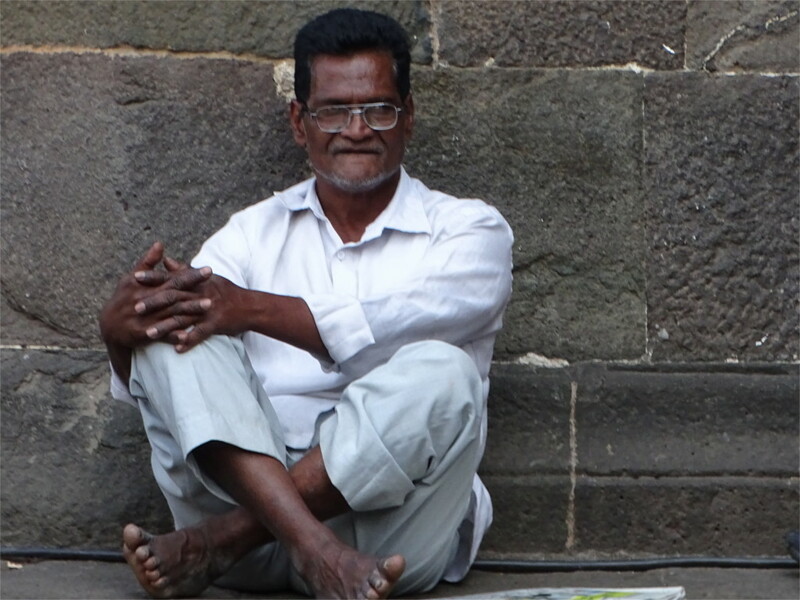 On the best of days, the rest of Maharashtra thinks of the residents of Pune as thrifty. Stories abound of how a Puneri will buy a litre packet of milk, empty the packet, wash it, and sell it to the neighbourhood junk dealer. Walking around Shaniwar Wada, the seat of power in India until exactly two centuries ago, I came across this Puneri institution. The red sign board proclaimed that this establishment deals in junk of all kinds. The black chalk board set rates for old newspapers, and, yes, empty milk packets! As I walked by, the owner came out to lean on the door. Puneris are supposed to be notoriously unfriendly, especially to people from Mumbai. So I didn’t ask for permission, but clicked away. He looked up, saw me, and walked back in. I could imagine him muttering to himself, “Tourist!”. So typically Puneri. We looked at a freezerful of interestingly labelled popsicles on sticks. Guava chili and Jamun seemed to be the most popular flavours here, judging by the emptiness of the containers. Madagascar chocolate and Meetha paan were almost as popular, though. I had gone out for dinner with a bunch of colleagues, and on the twenty minute walk to the pub had passed a white board with just a few words scrawled on it. Intrigued, I’d stopped to take a photo and then to peer inside a gate where a well-lit small courtyard stood dusty and empty. What did these flavours refer to? 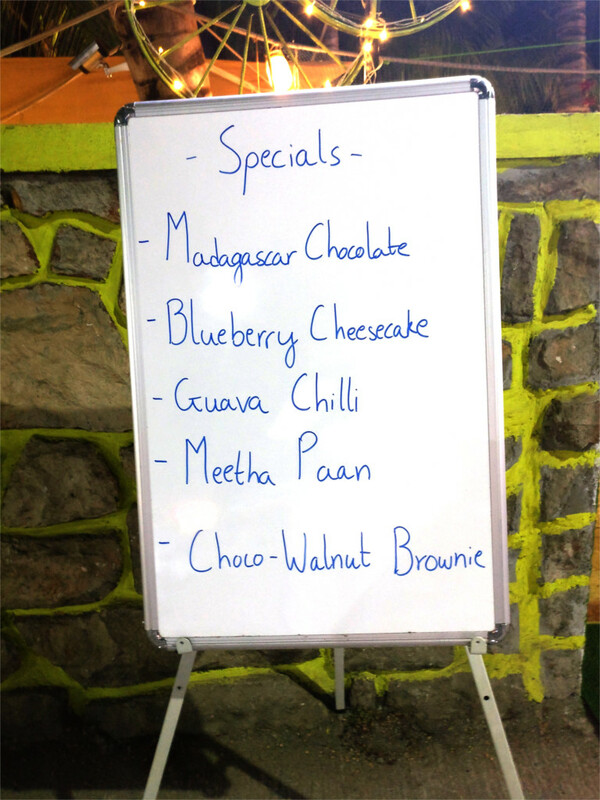 Guava chili and Meetha paan were so intriguingly different from chocolate and cheesecake. I looked around and a large and well-lit board gave the answer to the guessing game. I judged that half-past seven was too early for popsicles, gourmet or otherwise. We walked on. When we walked back after dinner the place had filled up. We milled through the gate for a look. Interesting, but no one was in a mood for a popsicle. One of my colleagues said something about having to watch the amount of sugar one has. The young guy behind the counter made a feeble attempt to snare a customer and said “Sir, these have very little added sugar.” It didn’t work. The average age of the clientele was probably between half and a third of our median age, so the sales staff gave up on us. I sent the photos to my niece and next morning I got a smiley face back from her. 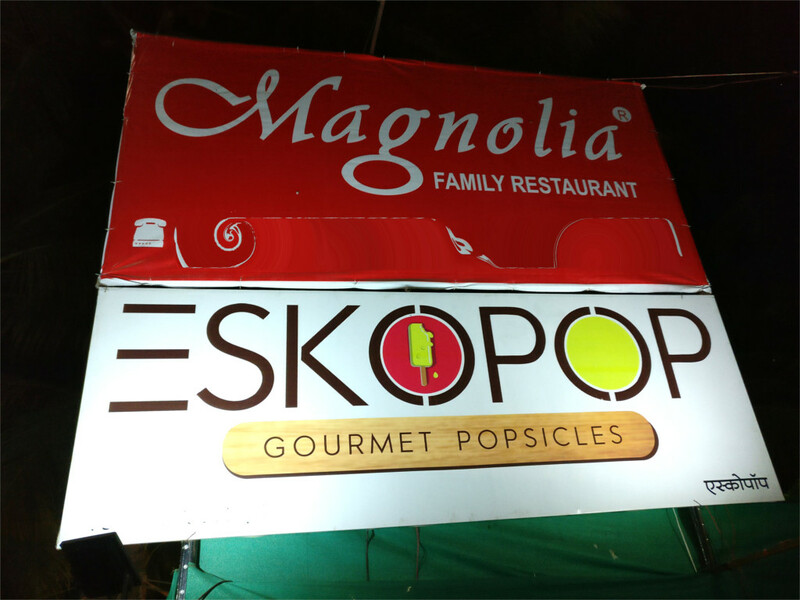 Author I. J. KhanewalaPosted on March 2, 2018 March 1, 2018 Categories Food, IndiaTags gourmet flavours, popsicles, PuneLeave a comment on Gourmet Popsicles! The Shaniwar Wada of Pune was briefly the center of political power in India: from its construction in the 1730s to the end of the Maratha empire in 1818. Strangely, only the northern wall of palace complex is built of stone; the other three walls are of brick. Walking along the walls I was stopped by the sight that you can see in the featured photo: an enormous arch which has been filled up, leaving a smaller off-center arched door which is now barred. I peered through the locked grille, and found signs of more arches and doorways having been blocked. When were these changes made? The largest arch looks like a ceremonial entrance, large enough to admit an elephant. In the unsettled century when this palace was in use, it is conceivable that such a grand gate became a liability, and was successively reduced into smaller more defensive entry corridors. What we see today is probably the last defensive measure. The corridor behind the grille must be still accessible, since it is relatively free of litter; it was probably cleaned a month or so before I took the photo which you see above. I’m sure there are enough contemporary documents to enable someone to write an architectural history of the complex, although I’m not aware of such a book. Here is niche history waiting for an author. We drove to Pune in the weekend, over a road blasted through the heart of the geological bomb which killed off the dinosaurs. The Mumbai-Pune expressway is probably the busiest road in India. Still, there are times when you can take your eyes off the road to stare at the incredible mountains around you. During the monsoon the mountains are covered in a carpet of electric green. Yes, there is such a colour; you have to travel here to find out what it is. In this season, with the brief winter on its way out, the grasses have dried out, turning into layers of gold against the red rock of the Deccan traps. These mountains are the Sahyadris, and the red rock is the dinosaur killer. Go off the road. Stop when you can. Look again at the mountains. The most noticeable feature of the Sahyadris are the horizontal layers in the rock. Many years ago, sitting at a roadside dhaba, I asked a geologist friend about this. Between sips of tea he mentioned the phrase Deccan traps. These are successive waves of lava which flowed out of our planet’s largest volcanic event and killed off the dinosaurs. A shiver goes through my spine even today when I sit and look at these six and a half crore (65 million) years old rocks. The continuous volcanism lasted for a few lakhs (hundreds of thousands) of years. 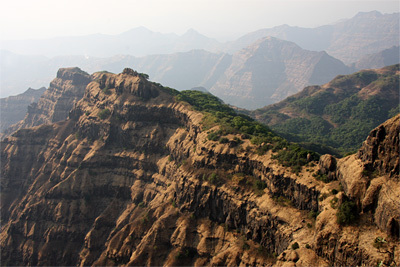 The lava covered an area larger than that of Maharashtra and Madhya Pradesh put together. Ash, carbon dioxide and sulphur dioxide pumped out by the volcanos changed the climate, making it first cooler, then hotter, and turning the rain acid. The dinosaurs died out, along with most of the life on earth. The earth was barren for about half a million (5 lakhs) years. When the volcanism ended and the skies began to clear, the mammalian takeover of the earth could begin. The next time you drive between Mumbai and Pune, look at the layer cake mountains around you: they are the reason you are here. It became necessary to travel to Pune on one of the rainiest days in the year. The night before I was to travel, the floodgates in a dam over one of the rivers which run through Pune had to be opened. The resulting surge of water apparently washed away ten cars parked inside the city. The next morning, when I was to return to Mumbai, there was a flood warning in Mumbai. The Mumbai-Pune Expressway makes it possible to drive between the cities in a couple of hours. The rain caused traffic jams at both ends, and increased travel time by more than half an hour. The continuing rains had damaged the surfaces of the roads leading in to the Expressway, adding another half an hour to the trip. Even so, I enjoyed the taxi rides. The hills along the way were the fluorescent green that the monsoon engenders. Streams leapt over mountain cliffs in ribbons of spray, paused at high meadows, and then fell in gauzy curtains to the sides of the road. Through the closed windows of the taxi I could hear the gurgle of water rushing through channels next to the road. When I passed Lonavala, the fields that I could see had turned into shallow lakes. The rain made it difficult to travel inside Pune. The only thing I managed to see was the famous architecture of IUCAA, the Inter-University Centre for Astronomy and Astrophysics. This was designed by Charles Correa, one of India’s most well-known modern architects. IUCAA is built as three interlinked courtyards, with low buildings and galleries running between them. I liked the courtyard called Akashganga, the Sanskrit name for our galaxy (the two photos here). Poincianas were planted in two rows. The ground beneath them was marked out in a triangular tiling which is supposed to call to your mind the fractal called the Sierpinski gasket. The trees were gloriously in flower; parrots fed on the fruits, and a wagtail skipped around below the trees. The galleries would have been great in winter. In the monsoon they were traps. One of the galleries had artful holes in the roof which is supposed to look like the vault of the sky studded with stars. During monsoon it is a mini waterfall. The cemented floor with a compass rose is a slippery mess. The flagstones set into the next courtyard have sunk in places, creating pools of standing water. The main building next to this has two open inner courtyards: one with a grove of bamboos, and another with a tree I could not identify. Both had turned into shallow pools. I need to come back in winter to see Correa’s creation at its best. There was the fragrance of good coffee somewhere. I followed my nose and came to an espresso machine. Just the thing for a wet day!